Prior to this late season swoon, we were pretty secure in 5th place in the NBA Eastern Conference. That would mean a first round match-up with LeBron James and the 4th place Cleveland Cavaliers. I don't see us winning that series. Today, we're only .5 games up on Washington. The goal is to finish sixth so we face the Orlando Magic. I think that's our best chance at winning our second playoff series in franchise history. It's a slippery slope, so we have to be careful not to fall into seventh. That's a match-up with the Pistons. We want 6th! We want 6th! 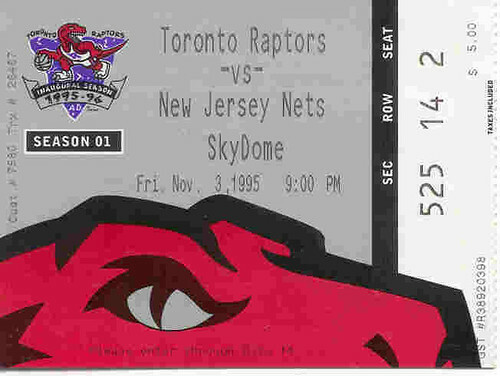 It seems Chris Bosh isn't the only Toronto Raptor uploading clips to YouTube these days. Jamario Moon is featured in this clip promoting the NBA slam dunk competition. Now that Damon Stoudamire and the Memphis Grizzlies have negotiated a buy out of his contract, he's about to be as free as a bird. It looks like Stoudamire will join the Celtics, but there's a slim chance he could become a Toronto Raptor. I would love to see Mighty Mouse back in town. He was our first draft pick, our first award winner and our first basketball star, and we loved him. Before he was traded to Portland, he was the man around these parts. Who wasn't a Damon Stoudamire fan? I'd love to see him back up Jose Calderon and finish up where he started off. Unlike Vince Whatshisname, Mighty Mouse didn't burn the bridge. I'd welcome him back with open arms. It turns out Chris Bosh isn't just a good basketball player, he's got a sense of humour too. He put together a little promo video in an attempt to secure the votes necessary to send him to the all-star game in New Orleans. I say 20.3 PPG and 9.20 RPG is reason enough. I rarely buy tickets to sporting events. I buy the odd Blue Jays ticket, but usually when I'm at a live sporting event it's because someone offered me free tix. So when I bought four tickets to last night's Raptors game, it was because the price was right and there was someone special I wanted to see. The tickets were $15 each, $60 for the four of us. You're tucked away in the Sprite Zone, but I don't mind that one bit. In fact, it's better. The kids are entertained during breaks in the action, Michelle actually won a tee-shirt that James wore throughout the game, and the crowd is young, enthusiastic and sincerely happy to be in the building. If you're taking kids to see the Raptors, I highly recommend the Sprite Zone. It's the best bang for your Toronto sports scene buck. The atmosphere itself is completely different than that of a Leafs game. The music is hip-hop and R&B, with Kanye instead of Nickelback. The crowd is much younger, less comatose and much less white. 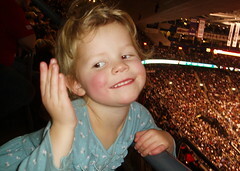 My wife, who I've never caught watching the Raptors on television, loves going to Raptor games at the ACC. My daughter keeps her eyes focused on the dinosaur mascot and James was blown away by the whole experience. 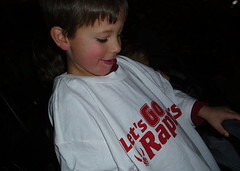 Raptor games are fun, even when you lose by 13. 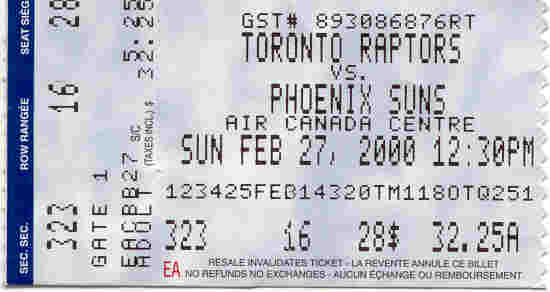 And of course, I was there to see Captain Canada, the greatest basketball player this nation has ever produced. Steve Nash didn't disappoint, dishing off a season-high 18 assists while chipping in 10 points. Leandro Barbosa scored the baskets but Nash was everywhere. He was worth every cent of my $15. Here are pics I took. A good time was had by all. Vince Carter of the New Jersey Nets will be sidelined indefinitely with a sprained right ankle. I don't mean to make light of another man's pain, but this image is deja vu all over again. I'm trying to heal, but there's always something there to remind me of the pain. How do you spell karma? 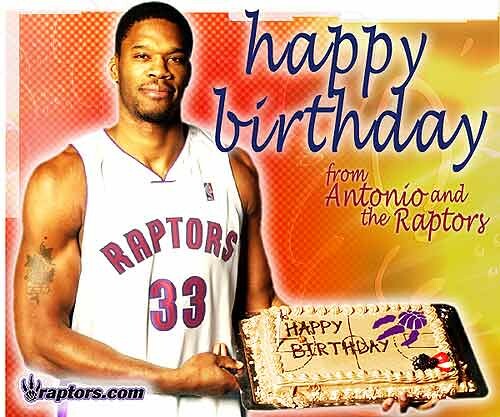 F-U-V-C.
Mo Pete played 542 games for the Toronto Raptors, a franchise record. His next game will be for the New Orleans Hornets who signed him to a four-year $23 million dollar deal. Morris Peterson was around a long time, and although I liked him, I never felt he reached his full potential. When I was ready to write him off and move on, he'd do something like this and blow my mind. When the Hornets come to town, give this guy a seven year salute.